Current: What is Product Owner's Role in Scrum? A Product Owner who owns the product on behalf of the company is a part of a Scrum team. However, a product owner has no authority over other members of the team, same as the Scrum Master. A Product Owner is responsible for looking after a product for an extended period of time and is accountable for achieving product success. As the product owner, you should directly interact with the customers and users, the development team, and other key stakeholders, as the picture below shows. The Product Owner have a vitally important decision making role to play though since they are the main link between the Scrum team and the customer. Thus, the Product Owner should be able to communicate effectively with stakeholders to lead the team’s discovery of the product and gather requirements. The Product Owner should be someone who understands the product vision and who can communicate that vision to the Scrum team. The Product Owner should understand the business objectives within a wider framework of the market, customer needs, competitors and digital trends. 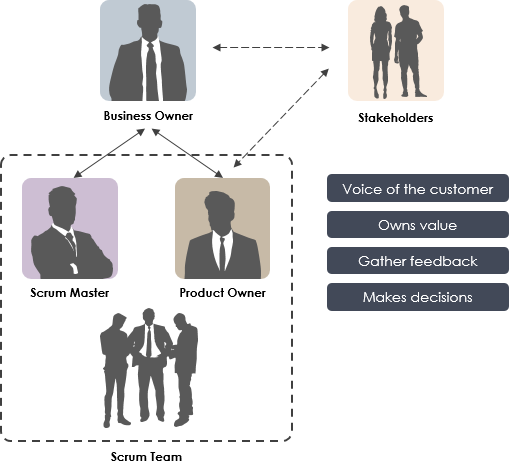 Where the Product Owner can be thought of as owning value on behalf of the organization and the stakeholders, and the Scrum Master owns the process on behalf of the development team. 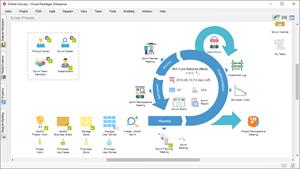 The Product Owner is responsible for managing the Product Backlog by communicating the product vision with the Scrum team. 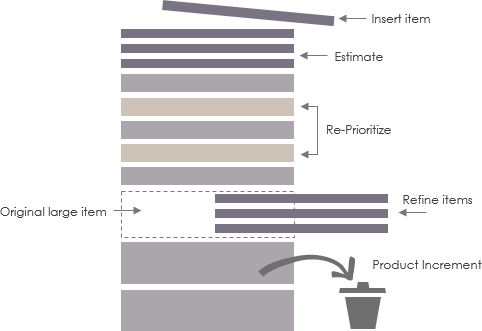 The Product Owner not only decides what goes into the Product Backlog but also decides on the priority of each item as shown in the Figure below. As mentioned above, a product owner is responsible for Product Backlog Management, in order to maximize the value of the Product. 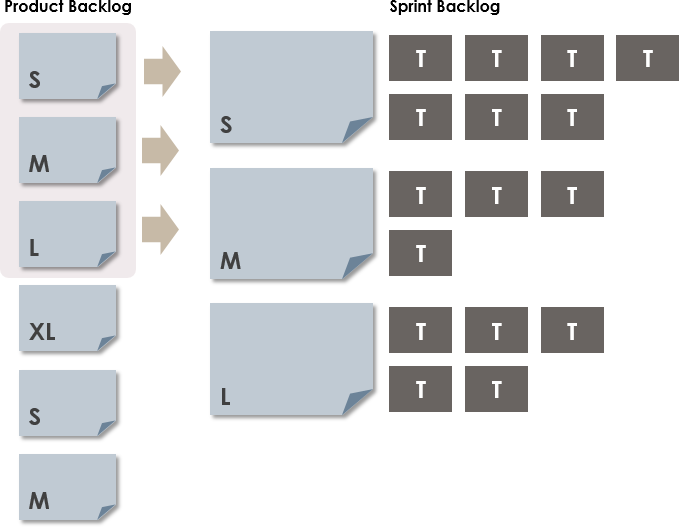 The Product Backlog is the single source of truth which contains all the tasks to be done on the Product. 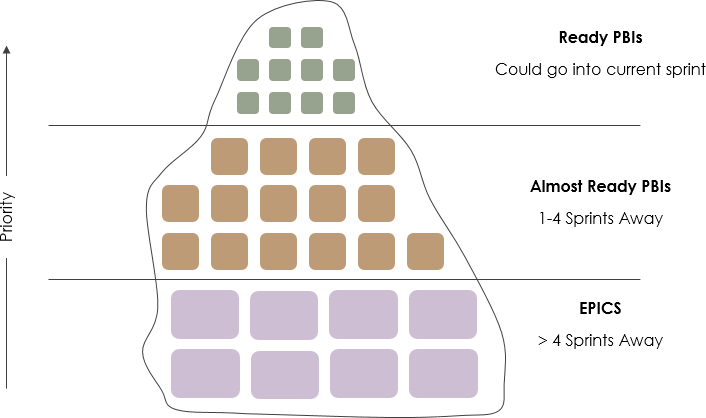 As a Product Owner, you will have to make some choices about what to build first and what to build later. A product owner also decide on what to build and what not to build by adding or removing items from the backlog from time to time and this process also called backlog refinement; it can either be a meeting, or most often, it is an on-going process or activity for grooming the product backlog readily for Sprint Planning Meeting. Highlighting the need for more detail in stories. The Product Owner must also ensure that the stories in the Product Backlog are presented in sufficient detail that they’re thoroughly understood by the team. This ensures that the team can plan sprints effectively and also that they know what needs to be done to complete each story. This is particularly true during Backlog Refinement where the Scrum team discuss the items at the top of the Product Backlog (i.e. those which are waiting to make it into the next sprint).